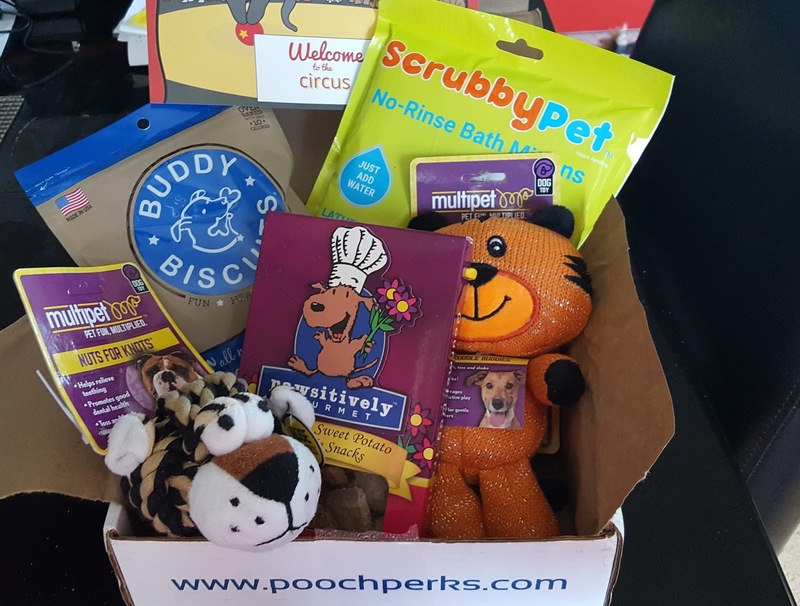 What: Pooch Perks is a subscription box for dogs containing 2-5 treats and toys. There are three subscription options: Sample Pooch (2 past items), Popular Pooch (4-5 toys & treats) and Custom Pooch (choose just treats, just toys, heavy chewer, or no grains). Boxes are also curated according to your dog's size. If your dog has allergies you can also note it down when you sign up. If you signed up before February, you're grandfathered into the previous subscription options. For reference, this review is for the older plan's Popular Pooch box for a medium-large dog (35+ lbs). It's springtime and the folks over at Pooch Perks are celebrating with a circus themed box! Personally I think it's kind of ironic with the impending Ringling Bros. shutdown. Maybe it's in honor of the iconic show? Whatever the reason, the box is here and my dogs are staring at me and drooling so I'll get this review pumped out as quickly as I can before my carpet gets soaked. Pawsitively Gourmet Sweet Potato Doggie Snacks - I'm not sure if this was intended as part of the circus theme, but these biscuits smell like Barnum's animal crackers (and the string resembles the packaging, too). They're all natural and contain just flour and sweet potato. 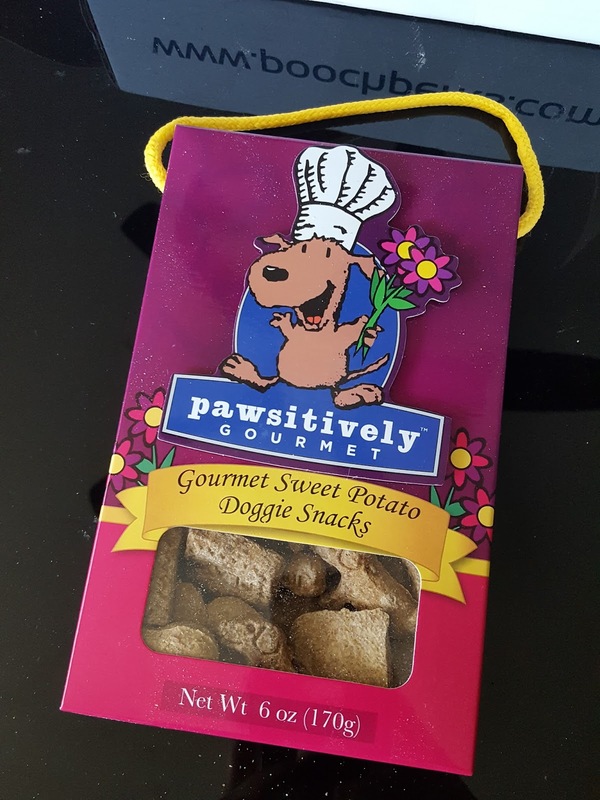 Pawsitively Gourmet is a family-owned business that specializes in adorable gourmet doggy treats. Gahhh, so cute! These sweet potato biscuits come in four fun shapes with doggy sayings. Pebbles loves them and I love that can feel good about giving them to her. 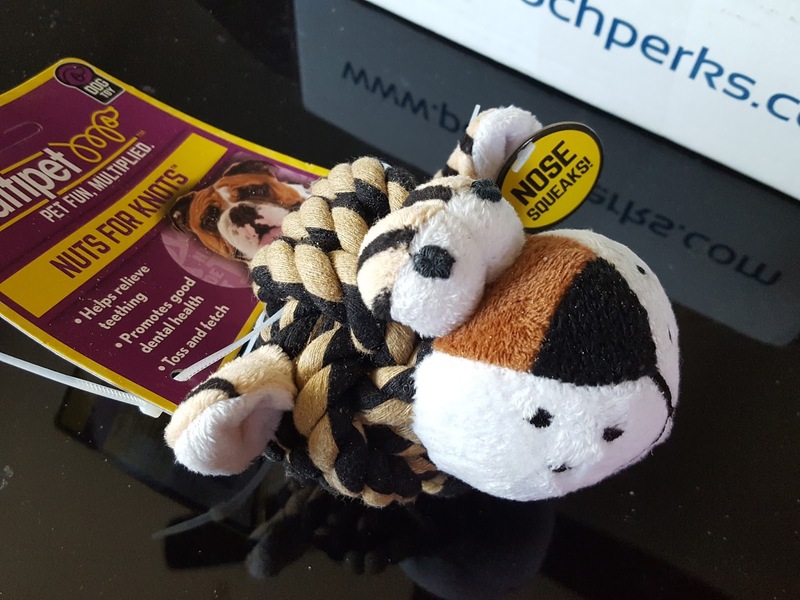 Multipet Nuts for Knots Rope Tiger - Yesss, a rope toy! We are fresh out of rope toys so this month's box came at the perfect time. I do hate that rope toys leave behind such a fiber-y mess but it keeps the dogs occupied way longer than a stuffed animal. And here's a nice bonus - this tiger has a squeaky nose! 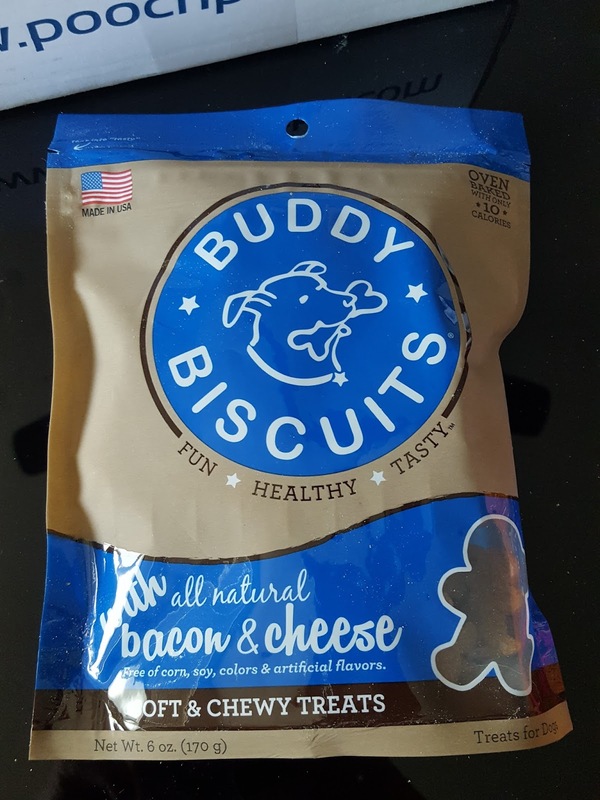 Buddy Biscuits Bacon & Cheese Treats - Made with all-natural ingredients, these Buddy Biscuits are also free of corn and soy. Plus they're made with bacon and cheese...mmmmmmm. 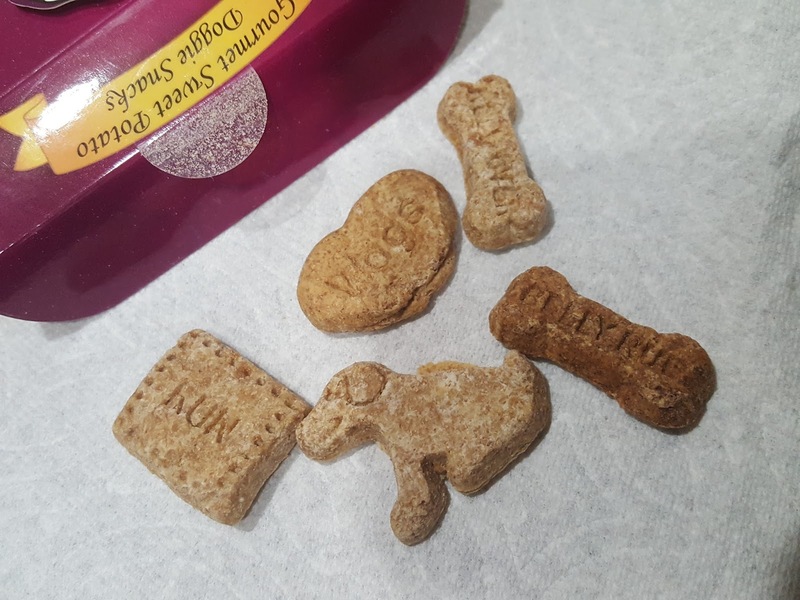 Each piece is just 10 calories so you can just break em in half and they'll double as training treats. 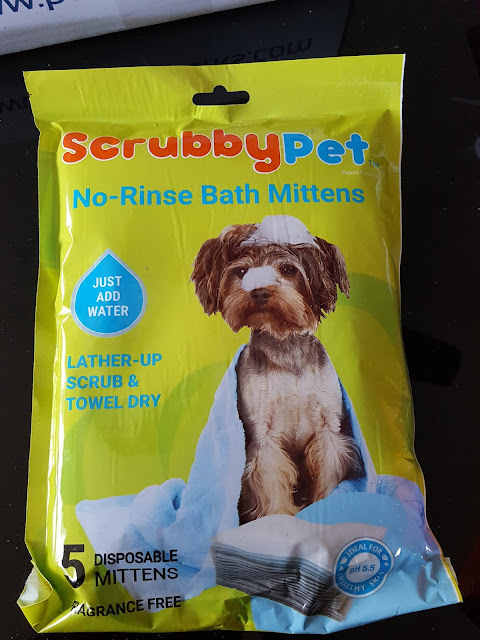 Scrubby Pet No-Rinse Bath Mittens - 5 pack - You don't need a hose or bathtub to wash your dog anymore. These disposable wipes already have soap on them. Just add water and it suds right up so you can scrub-a-dub your pup. And there's no need to rinse the suds off afterwards. Just towel dry and you're good to go. I'm not so sure how this will go down, though. I mean, what if it rains later on and my dog gets all soapy again?? And Macho has sensitive skin, so what if the residual soap dries out his skin? Multipet Cuddle Buddies Tiger - Here's another tiger for the circus box, but this one's cuddly. 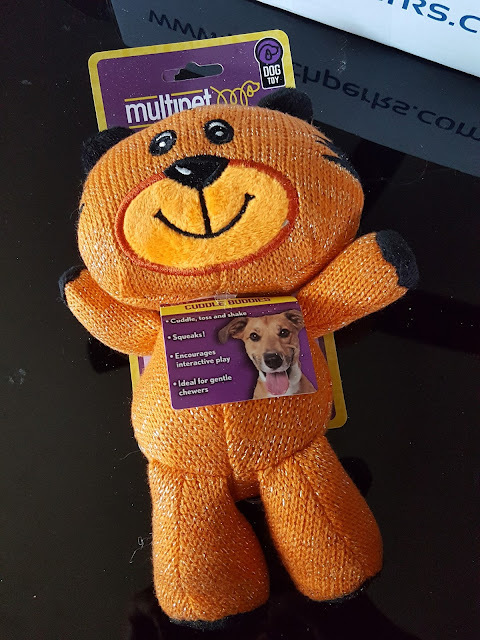 He's a squeaky, stuffed knitted plush that I'm sure my dogs will have a field day with. Pebbles will probably dismember him in minutes and Macho will de-stuff him. It'd be the first (and only!) time they'd win in a battle against a tiger. But they'll also leave behind a huge mess for Mom to clean up. Not good. The tag even says it's for gentle chewers, a.k.a. not my monsters. Verdict: I'm really glad to see both chewy treats and biscuits in this month's box. I like to mix up the textures; it keeps my dogs guessing and looking forward to treat time. The rope toy is going to Pebbles tonight. Lately she's been chewing on my husband's cardboard shipping boxes because she ran out of toys. I'm kind of curious about the bath mitts and might give them a try, though I have a feeling Macho's skin might be too sensitive. Oh well, he loves the hose anyway.